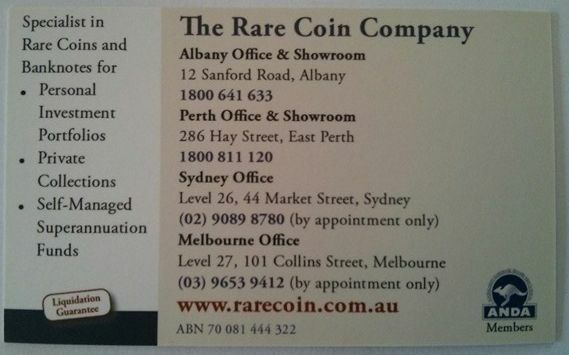 Former Rare Coin Company director Rob Jackman was earlier this month sentenced to 4 years and 2 months jail time for stealing and fraud. Investors and collectors suffered massive losses as the director tried to keep his failing coin business afloat before it was placed into liquidation in July 2013. The company thrived on offering premium collector coins or banknotes to customers with the cherry on the top being a guaranteed buy-back price including an investment return for coins or banknotes purchased. The Rare Coin Co kept investor’s numismatic items safe in secure vaults (and happily charged investors storage fees) as investors waited to collect their anticipated returns. As the global financial crisis hit and the coin and banknote market began to slide more investors sought to collect on the buy back guarantee and the company that grew from a $600,000 turnover in 1997 to $44.3 million in 2010 was unable to honour the guarantees. It is understood that efforts to keep the company viable included the company selling numismatic items that belonged to the investors and not the company. The dishonesty of the director will see Jackman serve at least half his jail term before being eligible for parole and has been ordered to pay restitution, but without assets and having been declared bankrupt it’s hard to see any of the $1.8 million being repaid.